A large part of our work involves works to improve and enlarge existing residential properties to all kinds of budgets from £10,000 to £500,000. 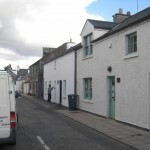 2015	The existing house was formerly two farmworkers cottages with a byre on the end. 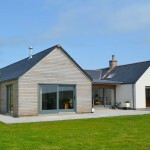 Our clients wanted to bring the byre into use as a living room with a sun room extension to the rear. 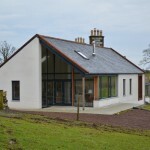 An extension to an existing farmhouse including a wheelchair accessible ‘annexe’, which is finished in slate and white render and draws from the traditional form of the farmhouse, and contemporary ‘link’ space with extensive glazing, timber cladding and a low pitch standing seam zinc roof. 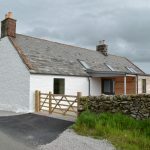 This former fisherman’s cottage had operated as a holiday cottage for many years before our clients took it over with a view to making their permanent home there. 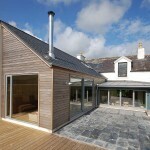 This project started was initially envisaged as a conversion of a former plumber’s workshop into a family dwelling in the Gatehouse-of-Fleet conservation area. 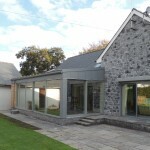 This new extension, replacing an earlier conservatory, connects the house’s living areas to the garden and provides an open plan kitchen / dining / living space. May 2006	Our clients required an extension to the rear of the existing house to provide a connection to the existing south facing garden, and a new welcoming entrance.